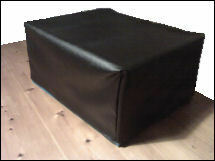 Custom made dust covers to protect your home and office equipment. CUSTOMER NOTICE: SORRY, BUT WE ARE NOT TAKING ANY ORDERS FOR THE NEXT FEW MONTHS. We are a small, friendly Manchester based company providing custom made covers to help protect and prolong the life of your home, office and pro audio equipment. Our covers are made from quality, durable fabrics, cut and sewn to your exact specifications to ensure the best possible fit. Your equipment will be fully protected from dust, dirt and spills. Visit our buy online page to enter your dimensions and choose your fabric. For more information on ordering and the fabrics available, please visit our how to order page. Orders will be dispatched by first class post within 7-10 working days.